Dump the coleslaw mix into a bowl. Add the onions, celery, and sunflower seeds. Break up the dry ramen noodles into small bite-size pieces and add to the bowl. In a separate bowl, combine all the dressing ingredients and mix well. 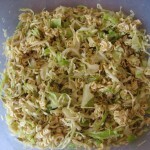 Just before serving, pour the dressing ingredients over the coleslaw mixture and stir to mix well. Prepare the macaroni and cheese as directed on the box. Once complete, stir in the Miracle Whip and remaining ingredients. Chill well. May need to stir in some additional Miracle Whip before serving.